Just wanted to share some things I noticed while trawling through news archives on Google looking for something else. Everything here provided "for what it's worth." SACRAMENTO, Calif. (AP) _ A former security guard wanted in a shooting spree that killed five people shot himself to death after a gun battle with police Monday, capping a tumultuous day of violence that came three weeks after another deadly rampage in Sacramento, police said. Joseph Ferguson, 20, shot a California Highway Patrol officer during the battle and possibly another person before turning the gun on himself, said Linda Casillas, a dispatcher with the Sacramento Sheriff's Department. Casillas said the officer was believed to be wounded, and the condition of the other person was not immediately known. ``It was such a mess out there,'' Casillas said. Authorities say Ferguson went on a shooting spree that began Saturday night because he was despondent over losing his girlfriend and getting suspended from his job with Burns Security a week earlier. His ex-girlfriend, also a Burns employee, and three other former co-workers were among the victims. After killing the four people, Ferguson handcuffed another former co-worker to a tree at the zoo and fled in her car, police said. Ferguson was heavily armed, and officials evacuated Burns employees out of fear for their safety. Ferguson claimed his fifth victim Sunday night when a Burns Security supervisor shot to death, police said. Ferguson kept the man and his wife hostage for more than 12 hours before killing the man and attempting to flee once again, authorities said. Ferguson did not make it far, dying at his own hands shortly after midnight Monday, authorities said. It was the second mass killing in Sacramento in three weeks. On Aug. 20, Nikolay Soltys, 27, allegedly slashed his pregnant wife's throat, then killed his aunt and uncle and their two 9-year-old grandchildren in Sacramento. Authorities say he fled with his son, who was found dead in a cardboard box a day later. He was later caught and charged with murder. Police said Ferguson told acquaintances in cell phone calls during his alleged rampage that he wanted to commit a crime even bloodier than Soltys'. Ferguson said ``he was going to outdo Soltys, something along those lines,'' said Sacramento Police spokesman Sgt. Daniel Hahn. In the end, Ferguson's alleged death toll stood at five. They were his girlfriend, Susu, 20, and another 32-year-old woman employed by Burns, who was not identified. Their bodies were found at a city equipment yard about 10 miles south of downtown that was apparently Ferguson's first stop Saturday. Police were summoned there by a call about shots being fired around 11:20 p.m.
Found dead shortly thereafter at a marina southwest of downtown were George Bernardino, a 48-year-old Burns security guard, and John Derek Glimstad, 19, an employee just hired at the city-run boat dock. Investigators were looking into the possibility that race might played a role in Ferguson's selection of victims. One of the dead was black and another was Asian. The deaths occurred about a week after Ferguson was suspended and vandalized Susu's car in an apparent response to their breakup. The suspect lived with his father and had no criminal record, authorities said. In a search of his home police found a cache of weapons, including two shotguns, two assault rifles, two revolvers, a ballistic helmet, a flak jacket and a gas mask. They also discovered an undisclosed assortment of white supremacist paraphernalia. Ferguson had apparently taken the weapons he used in the shooting from his home. During his rampage, sources said, Ferguson compared himself to Soltys and Oklahoma City bomber Timothy McVeigh. His background led authorities to conclude he is an extremely troubled young man. Police searching the Meadowview area home he shared with his father and brothers Sunday found racist materials, including some from the World Church of the Creator. They also found a number of weapons and a makeshift bunker beneath the house that sources said may have been used for target practice. "It was the second mass killing in Sacramento in three weeks." - It's worth noting that Soltys, the killer from a few weeks before, died in prison under suspicious circumstances. He was charged the week before 9/11. SACRAMENTO, Feb. 13— A Ukrainian immigrant charged with killing six members of his family was found hanged in his jail cell early today, the sheriff's department said. His lawyer called the death suspicious and officials said they were investigating. The dead man, Nikolay Soltys, had been undergoing mental evaluations after the killing of his pregnant wife, his 3-year-old son and four other relatives in August. Mr. Soltys's lawyer, Tommy Clinkenbeard, said, ''I'm baffled how this could have happened, given that he was in isolation,'' with surveillance cameras trained on his cell. Someone would have had to have been watching the monitor, Mr. Clinkenbeard said, because the cameras do not record. Sheriff Lou Blanas of Sacramento County said the area of the cell where the rope was tied was out of view of the camera. One of the most intriguing links between Mohamed and 9/11 is also perhaps the least explained. During the 1990s, Mohamed made various efforts to infiltrate sensitive U.S. locations, presumably in keeping with his ongoing mission to collect intelligence on behalf of al Qaeda and Egyptian Islamic Jihad. Mohamed was assigned as a security guard at a Northrop Grumman facility that developed sensitive components used in nuclear weapons. Mohamed sought a security clearance to work in the facility's classified areas, but his application was denied. Burns is a massive conglomerate with multiple divisions and thousands of employees. It was bought by and became a division of Securitas in 2000. So it's difficult, on many levels, to judge whether Mohamed would have been able to leverage his access usefully. Certainly, the Egyptian's track record with the U.S. Army certainly showed that he was capable of exploiting any kind of access to maximum effect. Although it would be premature to make a definitive statement about what Mohamed may have accomplished through this job posting, Burns Security did surface on September 11 -- in two different capacities. A Burns division known as Globe Aviation Services provided checkpoint screening at Logan Airport, including two specific checkpoints used by the 9/11 hijackers. As previously noted, Mohamed did a great deal of work for al Qaeda regarding airline security, including surveillance of airports, devising hijacking schemes and smuggling box-cutters onto planes for use as a weapon. Burns was also connected to a still-unexplained incident in Virginia. Shortly after September 11, the FBI arrested a Burns employee from the Washington, D.C. area named Mohammed Abdi. Abdi was a Somali national. He left that country for America in 1993 -- shortly after Ali Mohamed was rumored to have trained Somali insurgents on behalf of al Qaeda. After moving to the United States, he worked in a food service job at Reagan National Airport, then subsequently for Burns as a security guard at a federal mortgage processing facility. When the FBI found the car left behind the five 9/11 hijackers who departed from Dulles Airport near Washington, they discovered a map of the D.C. area with Abdi's name and phone number written with a yellow highlighter. 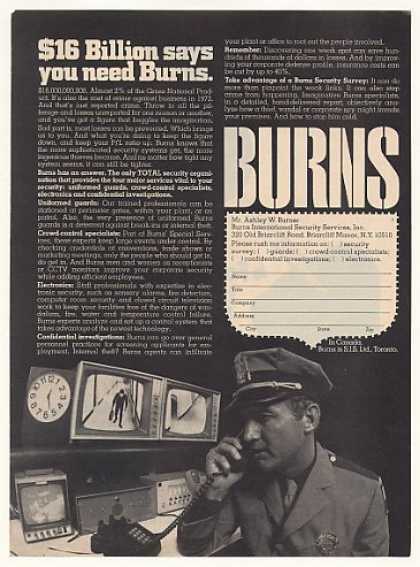 Burns' Globe subsidiary provided security at both Reagan and Logan airports. Investigators discovered Abdi had removed five Burns security guard jackets from his workplace before September 11. He attempted to give them to the Salvation Army three days after the attack. Like so many others who intersected -- perhaps only coincidentally -- with Ali Mohamed's long trail of associations, Abdi was never convicted of any crime related to terrorism. He was sentenced to four months in prison for check forgery and released under supervision in January 2002. That's all very provocative, but I'm going to wind back to Sacramento again. Ali Mohamed was based there for a period starting in 1997: Double agent Ali Mohamed is living openly in Sacramento, California. So he worked for Burns Security in a sensitive capacity, and was living in Sacramento? Sort of an alignment with Ferguson, then, the white supremacist Burns guard that said he wanted to be compared to McVeigh (a two-time Burns employee himself) and who went on a killing spree culminating on September 10. What the hell is up with Burns Security? In 1999, Securitas acquired Pinkerton, and in 2000, Burns Security, and several regional security companies in the United States. These acquisitions made Securitas one of the largest security companies in the world. Burns is frequently billed as Burns-Pinkerton in local business listings, since they are both owned by Securitas. In 2000, Securitas AB acquired another legendary, American private security firm, Burns International. Founded in 1909, the William J. Burns Detective Agency was also headquartered in Chicago. Burns was a man of integrity who had served as a national crime watchdog. During his career, he was known as “the greatest detective the U.S. had ever produced.” In 1921, he was appointed director of the newly formed Bureau of Investigation that later became the FBI. Burns’ drive, determination and commitment to service helped his company grow from a small detective agency to the second largest security provider in the U.S. While many agencies are engaged in routine investigations, some are specialists, and the biggest ones provide a range of services capable of fulfilling almost any client's needs. (Sometimes, of course, they get in trouble doing so: for example, in 1971, six executives of Wackenhut, Pinkerton's, and Burns were found guilty of bribing New York City policemen to obtain confidential records of would-be employees of American and Trans-Caribbean Airlines. Why they resorted to bribes is unclear, though, since the Rand Corporation reports that Wackenhut and Pinkerton's - never mind Burns - have dossiers on more than four million Americans). Of course, the work may not be to the agent's liking, especially if he considers himself a friend of labor. Fidelifacts and Intertel aren't the only forms that have had unions as their targets. According to an annual report of the Burns Agency, for example, undercover agents are available to probe inventory losses, pilferage, theft, fraud, falsification of records, forgery, poor employee morale, willful neglect of machinery, waste of time and materials, theft of tools, unreported absenteeism, supervisory incompetence, inadequate surveillance, and something called "delicate investigatory matters." The means of undercover investigation is also described in the Burns report: "A frequent procedure," it says, "is to have the investigator obtain work in the company in a normal manner... He works full days, fills an actual job and draws a regular paycheck, arousing no suspicion among fellow employees. The person who arranged the investigation is kept informed by means of secret reports. When the work is completed, the operative leaves the job in a normal way so that no one ever need know his true identity." In the immediate aftermath of September 11, the mainstream newspapers were replete with items implicating Argenbright security (which was charged with overall security at Logan Airport) with lax procedures, thereby largely giving a "free pass" to the two companies that actually handled passenger screening for the hijacked planes out of Logan. Besides Huntleigh, the other security company at Logan screening passengers was Burns Security, through its subsidiary, Globe Security. Burns Security, the former employer of Timothy McVeigh and suspected al-Qaida member Mohamed Abdi (connected by authorities to attempted "millennial" bomber Ahmed Ressam), also happened to make the news in the most high profile incident preceding September 11. Just a few days before the Twin Towers came down, a disgruntled Burns security guard by the name of Joseph Ferguson went on a murderous rampage, killing, among several others, his supervisor at Burns - a Ukrainian immigrant by the name of Nikolay Popovich, in the Sacramento suburb of Rancho Cordova. Before Ferguson turned his gun on himself, he claimed that he was inspired to follow in the footsteps of Timothy McVeigh and Nikolay Soltys, a Ukrainian immigrant who, only a couple weeks before Ferguson, had went on his own mass murder rampage in the suburb of Rancho Cordova. In Ferguson's home, authorities found right wing militia literature, particularly that of the World Church of the Creator. The Ferguson episode also caused a temporary disruption in Burns' West Coast operations, forcing many of its employees to steer clear of work, out of harm's way, until Ferguson could be apprehended. A post-script on Nikolay Soltys, the Sacramento mass murderer who inspired Ferguson's rampage: on February 12, 2002, Soltys' lawyer, Tommy Clinkenbeard, revealed in an Associated Press article that a Sacramento County social services agency was tracking Soltys before the slayings, and that Clinkenbeard was barred by court order from seeing all of Soltys' social services records, which were sealed. Clinkenbeard said that he intended to subpoena those records, but Soltys was found hanging in his jail cell the very next day. His cell had been under 24-hour surveillance. What, if any, was the connection here to September 11? Were these copy-cat mass murder episodes just a random occurrence - or perhaps indicative of a far more murky, complex drama playing out just below the surface? Yet none of this would have merited any notice in chronicling the Legend of 9/11, had there not been a crucial Burns/Al-Qaida/Right Wing Militia/Sacramento nexus in the millennial lead-up to 9/11. In the weeks leading up to January 1, 2000, the news media were swamped with speculations of impending catastrophe. We had already experienced the domestic terror wrought by Timothy McVeigh (representing the right wing militia set) and Ted Kaczynski alias the "Unabomber" (representing the lone wacko set). Now we were told to expect an apocalyptic meltdown of our technological infrastructure by way of the Y2K "bug", or, alternatively, an attack by America's self-declared Number One Enemy - Osama bin Laden. The expected catastrophe came 21 months later than expected, with the blow struck in New York City. Yet according to the Official 9/11 Legend, the expected millennial catastrophe was actually averted two weeks before the new year, with the arrest in Seattle of al-Qaida operative Ahmed Ressam. Ressam, as was later discovered, was on his way to mastermind a massive terror attack on the West Coast - at Los Angeles International Airport, a facility secured through the services of Burns Security. After September 11, authorities arrested a former Burns security guard named Mohamed Abdi in Washington, D.C., on the pretext that he was connected to Ressam. Ten days before Ressam was arrested - on December 4, 1999 - two right wing "militiamen" were arrested on charges of plotting to blow up, on the new year, a Suburban Propane facility at Elk Grove near Sacramento. It was thought that had they succeeded, hundreds of casualties might have resulted. It is thus on the West Coast, in the lead-up to the millennial new year, that we have the convergence of a pre-existing domestic threat (i.e. the militias stoked through the legends of Waco and Ruby Ridge) and a pre-existing foreign threat (i.e. the bin Laden minions stoked through the legends of Gulf War '91 and World Trade Center '93). As we shall see later in this article, these two threats had actually converged for the first time back in April 1995, with Timothy McVeigh's destruction of the FBI Murrah building in Oklahoma. Sacramento, though by no means the only West Coast city with an alleged al-Qaida connection, did seem to have a magnetic pull for this type of convergence. An al-Qaida graduate of Cal State, Sacramento, Raed Hijazi, was charged with plotting to blow up a Jordanian hotel on the millennial new year, while another al-Qaida operative, Ali A. Mohamed - a former Sacramento resident who was also a U.S. Army sergeant in Fort Bragg, N.C. - had pleaded guilty to the 1998 U.S. embassy bombings in Africa (the bombings that had garnered bin Laden his most widespread notice up until the U.S.S. Cole attack in October 2000). On the domestic terror front, Sacramento was also the scene of the notorious racist attacks on local synagogues by the Williams brothers. In The Propaganda Preparation For 9/11, I posited the existence of two key domestic operative cliques - one based in New York City and the other in Florida (particularly in Tampa, by MacDill Air Force base). But the crucial question is this: was a West Coast operative clique also to play a role on September 11 - and if so, then at what point was the West Coast aspect of these operations scotched? WILLIAM J. BURNS INTERNATIONAL SECURITY SERVICES, INC. The second largest contract guard service in the United States . . . Founded in 1909 by William J. Burns, a former investigator for the U.S. Secret Service, and still controlled by his family . . . For 40 years the investigative arm of the American Hotel-Motel Association . . . Primary source of revenue is uniformed guard service, although firm is moving increasingly into electronic surveillance and alarm services ... In 1972 provided 48,900,000 hours of guard service to 18,600 clients . . . Maintains 110 branch offices in the United States plus offices in Puerto Rico, Colombia, the Virgin Islands and the Bahamas ... A Miami subsidiary, The Burns International Investigation Bureau, conducts undercover investigations and intelligence-gathering operations abroad.